"Few things these days make me feel as productive as sewing. Maybe that's because it's one of my only activities with a concrete result that lasts for more than 20 minutes or so?" The first comment was from a friend whose kids have grown up and left home. She said, "I hear you!!" I have to admit that I was taken aback, because I was hoping that by the time I reach her stage of life, the frustration and discouragement of having most of my work quickly undone by small children on a perpetual seek-and-destroy mission would be far behind me. She explained that for her it's because a woman's work is never done. While her husband completes projects, she does laundry, fixes a meal, washes the dishes, vacuums the garage, etc. I remember, way back when I was a childless housewife, being astonished at just how busy cooking and cleaning for two people in a small apartment kept me. Unless I forced myself to take breaks, I could spend every waking moment in the kitchen or doing housework. But I got a tremendous sense of accomplishment and satisfaction from it. I enjoyed how clean and tidy our apartment was. I took great pleasure in making gourmet meals and experimenting with new recipes. I found it all to be fulfilling. 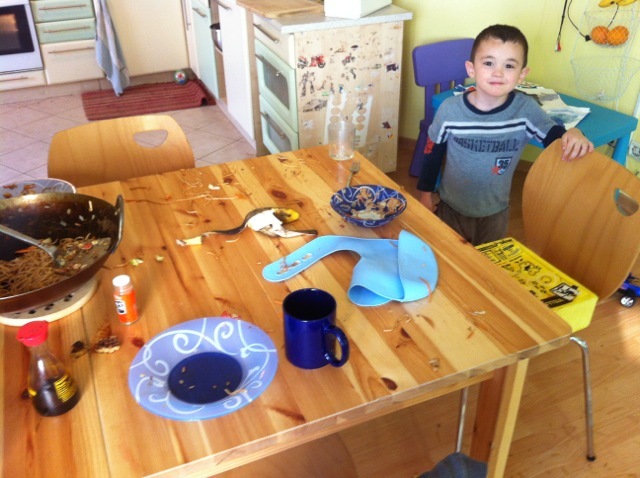 Unless the children are asleep or absent, our apartment is never tidy these days. And though I do my best to keep it clean, as soon as I clean something, someone comes along and pees on it, spills soup on it, litters it with hundreds of tiny bits of paper, spits sunflower seed shells all over it, or scatters handfuls of mashed-up bread crumbs everywhere! At some point I began to ask myself, What's the point?? And as far as cooking goes, I still enjoy it, but it's not the same. Despite the fact that I've instituted a strict rule that the ONLY comment a child may make about a meal is to say, "Thank you, Mommy, for breakfast/lunch/dinner," these days many of my gourmet creations are met with a whiny chorus of, "Mommy, I don't like this!" No matter how delicious the meal really is, it's difficult to enjoy with that background noise. And even when I do manage to make something that everyone loves, it's still difficult to enjoy, because one boy wants a fork instead of a spoon, then someone else wants me to get him the green Tabasco sauce (I kid you not), and the third one wants his mouth and hands wiped with a wet cloth, then everyone wants a drink, and then somebody drops part of his meal on the floor, and then the youngest one asks to be taken to the bathroom to poop, and while I'm out of the room the other two start a food fight! No wonder I'm finding sewing to be so satisfying. But after posting that status update on Facebook tonight, I began to do some thinking. It's true that these days the result of most of my labor is fleeting, and much of my effort produces no visible results. 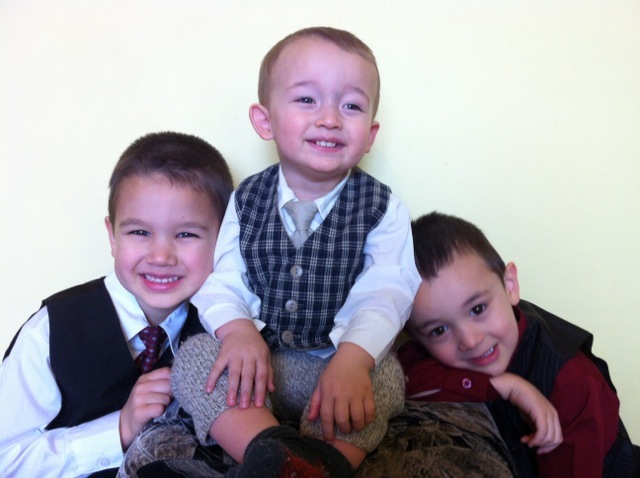 But every day, in small ways and big, I'm working to guide three little boys as they grow into manhood. I don't know what that final result will be like, but I keep going because I'm confident that it will be more than worth all the toil and sweat I'm putting in now. Thanks, Heidi! We mommies of littles need some solidarity! Honestly, I don’t always see the positive in it. Today, for example, was a difficult day, and I even lost my temper (and my perspective) a few times while trying to get the kids ready for bed. Thank God, they don’t hold grudges, and when I apologized, my 5-year-old said, “That’s okay, Mommy. We forgive you.” I’m so thankful for God’s abundant grace and His mercies that are new every morning. Tomorrow is a new day, “with no mistakes in it yet,” as Anne Shirley was fond of saying! Get a dog. They help with food scattered on the floor and clean off sticky hands and faces. It actually is great to have dogs with small children. We have not had ours for a couple of months, as we have been staying with family, and it is so much more work to clean up floors, etc. without them. I would not get a puppy, but maybe an older dog would help out some. I feel the same way as you. As soon as one thing finally gets cleaned, there is a new mess. And trying to unpack a house with a 20 month old and an 8 month old is never ending and exhausting. Prayers!! I LOVE dogs, but they aren’t very practical with a missionary lifestyle. Dogs are a high-maintenance pet here, where most city dwellers live in multi-story apartment buildings. That doesn’t mean that people don’t keep dogs, but finding someone to keep yours when you go back to the States on furlough for a month or two every few years could be a huge challenge! I hope you are able to unpack and get settled in soon. I know how frustrating it is to live out of boxes. Hang in there!